© Copyright Brian Abbott and licensed for reuse under this Creative Commons Licence. This abandoned corner of the North-East has seen more than its fair share of industrial blight over the years. The heights of Nose’s Point and thereabouts have seen ironworks, a bottle factory and a chemical works built, thrive and demolished over the years – as well as, of course, Dawdon Colliery, which closed in 1991. Add to the mix random railways and a ballast dumping ground for merchant ships, and it is a wonder that it looks as scenic as it does today. Blast Beach, seen in the foreground of the picture above probably got its name from the blast furnaces of the ironworks, or is perhaps a slight corruption of the word ballast. Such was the state of the area prior to its recent clean-up that the headland used to protrude further out to sea thanks to the dumping of industrial waste – and a platform, or crust, of compacted slag and slurry covered the beach, again extending far out into the waves (you can still see the edge, or lip, of this artificial surface where the rocky beach abuts the land). It looked so barren that it was used in the opening scenes of the film Alien 3 in 1992. With the retreat of industry, nature – with a little help from man – has largely wiped the grime from the shores and the cliffs. However, with the protective coating of waste now gone, coastal erosion is a major concern. Seemingly an early form of the modern-day village name of Dalton(-le-Dale), ‘Dalden’ Tower was built at least as early as 1375, when it passed from the hands of the Escolland family to the Bowes family. Prior to the switch, the Escollands had changed their name to Dalden, the name of the village – hence the name of the structure. For two centuries it remained a popular and well-used residence for the Bowes family, subsequently passing through the hands of the Collingwoods, Millbankes and Londonderrys, but it has been derelict since at least the early 1700s. What remains implies that the structure was lofty, though not especially designed for defence – more residential, in fact; though there is some evidence of a moat. The living quarters on the ground floor were clearly high status, with elaborate fireplaces, as well as remains of two small shields dating from the 14th century. There is little to indicate what the upper portions of the building may have looked like; but a tower seems likely (16th century), as well as, possibly, a circular turret, as evidenced by traces of a spiral staircase. The site has been excavated twice, in the 1960s and the 1980s. To look at the map now, you would think that Seaham must have been there for ages. Its piers reaching confidently out to sea, the lines of its railways – current and past – twisting their way through the town, to say nothing of the considerable scattering of churches, halls and the like thereabouts. But almost all of that which is man-made between the modern-day A19 and the eastern seaboard has sprung up in the last 170 years or so. Like many other settlements of the region, of course, it owes its spectacular growth to the Industrial Revolution. 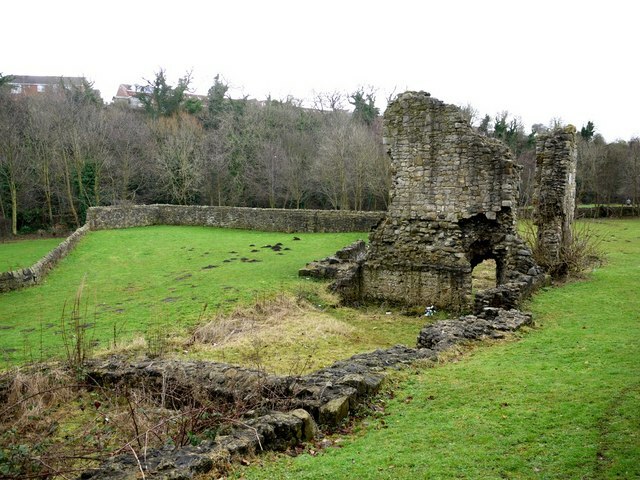 Before the arrival of industry, ‘Seaham’ amounted to little in the way of conurbation, and centred on the still countrified environs of Seaham Hall, including the ancient church of St.Mary’s and the Old Vicarage, all of which lie a mile north of the town centre of today. Even as late as 1894, it was described thus: “There is really no village of Seaham: the church and the residence of the rector constitutes what is known as Seaham, which is situated on the coast, about five miles south of Sunderland.” What we now recognise as Seaham was, formerly ‘Seaham Harbour’, where, to quote the same 1894 source, “seventy years ago there was not a house or a path; and when it was proposed to create a port at the place, the project was treated as visionary and absurd.” The harbour was build in the early years of the Victorian era – curiously, at a point where no river meets the ocean – for the sole purpose of meeting the needs of industry, namely, getting coal and glass bottles out, and timber and silver sand in. Pits were sunk, too, of course, in great profusion from the 1840s, leading to the creation of, among others, New Seaham, or Seaham Colliery, a little inland. 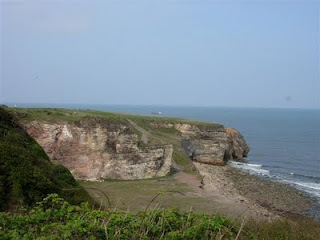 During the course of the early twentieth century, the variously-named settlements grew and merged into the Seaham we now see on the modern OS map – whilst swallowing nearby villages such as Dawdon; and leaving others, such as Dalton-le-Dale, the centre of the former ancient parish, languishing in the past. The history of the town is well-served by many websites, which can be easily Googled. The Seaham Colliery Disaster of 9th September 1880 was one of the worst of its kind in history. One hundred and sixty-four men and boys died after an explosion swept through the pit-workings, thereafter dubbed ‘Hell Pit’ by the press at the time of the occurrence. The episode is rife with tales of individual heroism and sad stories of epic proportions. Among them, the tale of one George Dixon, who chose to stay in the devastated pit with his young injured putter boy rather than take the chance to escape. “Nay, I’ll stay with the lad,” he was heard to say – his last words, as it happened, for their two bodies were later found lying together. One other touching find was a board found next to four bodies with the words, written in chalk: “Five o'clock: we have been praying to God.” And, on the reverse: “The Lord has been with us. We are all ready for Heaven.” The board now stands in nearby Christ Church. Seaham Colliery, opened in 1849, almost immediately acquired the nickname ‘The Nicky-Nack’ or, more simply, ‘The Nack’; though, as time passed, I suspect that not many folk knew quite why. The story goes that in the 1820s and ‘30s a local man by the name of Tommy Chilton became well known in the vicinity of the future pit, being something of a local character. He held the now long-gone windmill, and also ran the local pub, The Mill Inn (still standing). Besides his dual career, he was also something of a technical genius, and regularly entertained folk with his ‘electrical devices’ (whatever they were). Most famously, though, he had a talent for repairing women’s spinning wheels. At the time, a model called the Knack-Reel was in use, with its distinctive ‘nicky-nack’ action. These new-fangled contraptions were somewhat complex in arrangement and prone to mechanical failure – and in would step Mr Chilton to fix ‘em. Tommy, it seems, had the knack, like no one else for miles around; and, in time, his dwelling at The Mill Inn became full of old spinning machines in various states of repair. And so the inn came to be commonly known as ‘The Nicky-Nack’ – and Tommy, in turn, became ‘Tommy Nicky-Nack’. So when, in 1849, a new coal shaft was sunk within a stone’s throw of Tommy and his inn, it, too, borrowed the curious tag of ‘The Nicky-Nack’ – or more commonly still, ‘The Nack’. It’s true, I tell you. 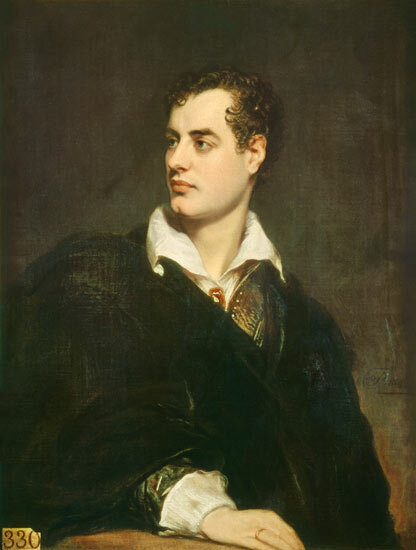 This most famous of phrases was once used to describe the flamboyant English poet, Lord Byron, remembered chiefly here in the North-East for his short-lived marriage to local heiress Anne Isabella Milbanke – the ceremony of which took place at Seaham Hall in 1815. The moody, broody Byron and the prudish Miss Milbanke first met in London, and when the great poet deemed it necessary to rescue his perilous financial state by way of an advantageous marriage, his attention fell upon Anne Isabella, whom he considered “a very superior woman, and very little spoiled, which is strange in an heiress … an only child, and a savante … a poetess, a mathematician, a metaphysician … there was never … a more amiable being.” And so they were married, in the Drawing Room of Seaham Hall on 2nd January 1815. Within days they were bickering. During their three-week honeymoon at her father’s estate at Halnaby in Yorkshire, the new Lady Byron was said to be “greatly distressed” by the “irregularities of her husband.” Byron himself found day-to-day life at Seaham dreary – or more accurately, perhaps, the husbandly and social duties so. A great quarrel occurred in the sixth week of their marriage, after which they lived separate lives, before they eventually formally separated on 16th January 1816, little more a year after their marriage. Byron soon left England for ever – leaving his ex-wife and their baby daughter behind. Note: The Byrons’ daughter, Ada, is generally recognised as the world’s first “computer programmer”, thanks to her work with the famous Charles Babbage – see here. 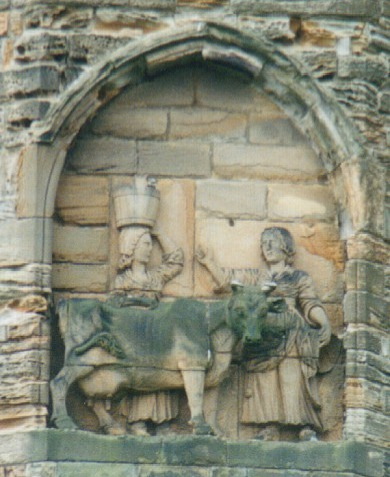 The story of the Dun Cow, as depicted in the above eighteenth-century panel on the north facade of Durham Cathedral, supposedly explains how the remains of St.Cuthbert came to find their way to the city of Durham – an event which led, in turn, of course, to the construction of the mighty Durham Cathedral. Legend has it that in around 995AD the monks of Lindisfarne, whilst traversing the North-East with the saint’s holy remains in tow, came to rest upon Warden Law, a prominence a little to the north-east of Houghton-le-Spring. On attempting to resume their journey they couldn’t move the cart upon which the coffin was being carried, and resorted to prayer in order seek divine guidance. Bishop Aldhun (or the monk Eadmer – accounts vary) then had a vision in which he was told to take St.Cuthbert’s remains to ‘Dunholme’, but nobody knew where that was. The story goes that the monks then overheard a passing milkmaid asking a local woman if she had seen her wandering dun (greyish-brown) cow. The local was heard to have said that she thought she’d seen it walking towards Dunholme, whereupon the maid made her way westward. The monks then quickly gathered themselves and returned to the coffin with the intention of following the young girl, whereupon they found that, miraculously, the cart now moved freely. And so the party moved happily down the road, bound for the saint’s final resting place. Mind you, it’s not the only hill that claims the rights to the story! 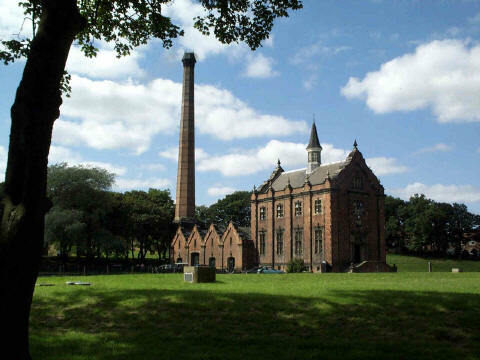 Now known as the Ryhope Engines Museum, this splendid landmark is one of the best examples of its kind to have survived from the Victorian era. It was opened in 1868 to serve the Sunderland area, providing it with a supply of clean water for a century before it closed in 1967. Though the station no longer pumps water, its two 100-horsepower beam engines are kept in working order and prodded into life for the benefit of visitors during regular ‘steam days’. Like similar stations in the region, the idea was to draw clean water up from the magnesian limestone rocks below, and thus improve the lot of the expanding populations of the local towns – in this case Sunderland. It was all in response to the cholera epidemics of the early nineteenth century, of course, and followed various Acts of Parliament which facilitated the creation of the Sunderland & South Shields Water Company in 1852. In line with other similar stations (including that at Cleadon), Thomas Hawksley was the architect, the planning and construction process spanning 1864-68. Few settlements the size of Ryhope can claim to have had two railway stations – and surely no other place in the country can have had two within a few dozen yards of each other, both operating at the same time! This curious state of affairs came about because of the number of competing railway companies in the region during the early years of the railways. What was originally known as Ryhope Railway Station was opened in 1854 as part of the Londonderry, Seaham and Sunderland Railway system, built by local notable, Lord Londonderry, to help ship his coal (and a few passengers) to the coast and Sunderland. Within a year, though, a second line and station graced the still modest village as a competing company spread its wings. The two stopping points became known as East and West Stations, respectively, and operated quite independently of one another, yards apart. The course of the two tracks can still be clearly made out on the modern-day map. The ludicrous state of affairs didn’t last, with the stations’ amalgamation in 1900. The western track (Londonderry’s old line), which once went all the way to Durham City, is now disused (being finally closed to passengers in 1952); whilst the eastern track still carries folk betwixt Sunderland and Middlesbrough – though no one has disembarked at Ryhope since 1960 when the old East Station complex closed. There’s a neat track plan of Ryhope here, which may explain things a little better.